Jake Cuenca has denied speculations that he was alluding to the loveteam KathNiel regarding his twitter rant about local magazines. In his tweet, the actor said: "What's happened to magazines here? They just put people who could sell rather than having people who can actually influence fashion?" 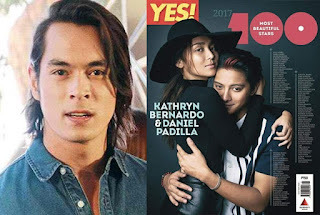 Many thought that he was referring to Kathryn Bernardo and Daniel Padilla as it was posted on the same day when the loveteam was launched as the the cover of Yes Magazine's Most Beautiful Stars issue. "I was not mentioning any single actor. I wasn’t going off about actors or celebrities. I was talking about magazines," the actor explained during the press conference of his upcoming Cinemalaya entry Requited. He even mentioned that he's on good terms with Daniel so it's impossible for him to malign their cover. “At the end of the day, alam ba ng mga tao kung gaano kami ka-close ni DJ? Okay kaming dalawa nun. I’m not pertaining to any celebrity." he said.